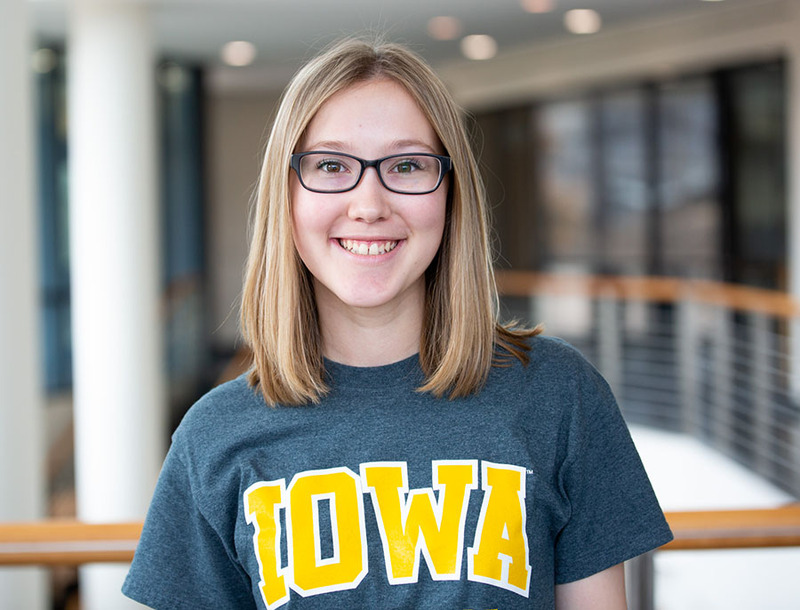 Student Leighton Hill found a perfect fit in the undergraduate public health program at Iowa. Starting college can be a daunting experience, but Leighton Hill quickly found a sense of community at the University of Iowa College of Public Health. Now a junior, Hill has emerged as a student leader, successfully balancing classes, work as a Resident Assistant, an internship, and other student organization activities. Originally from Minneapolis, Minnesota, Hill never felt intimidated about talking to professors and graduate students about her classes or career aspirations, something that can be overwhelming to many first-year students. Hill is now playing a vital role in fostering that sense of support among her peers. This year, Hill serves as both Resident Assistant (RA) of the new Public Health Living Learning Community and as a board member of the Undergraduate Public Health Organization. During the 2017-18 academic year, Hill and a handful of students came together to establish the new student group. This year, their efforts have turned to planning and holding events. At one meeting, graduate students discussed their paths and areas of specialty to highlight the variety of opportunities in the public health field. Another meeting featured a guest speaking about her global public health work. Other events are social in nature, aimed at building community and helping students unwind with peers who share similar academic goals and interests. Once per month, the group plans a service project. In the fall, members devoted a weekend morning to building a Habitat for Humanity house. The group’s mission doesn’t end there, says Hill, its operations director. The organization will serve as a liaison between undergraduate students and CPH administration to relay suggestions and feedback. The role of RA in the new Public Health Living Learning Community in Catlett Hall seemed like a “perfect fit,” Hill says. Communities offer many benefits to students, including stronger academic performance and higher retention and engagement. Hill handles traditional RA duties, such as helping roommates work out differences, having regular one-on-one conversations with residents, and planning social events. She also serves as a mentor, sympathetic ear, and informal CPH adviser, helping to cement a sense of community among students with an interest in public health. Residents come to her with questions about public health events, potential career paths, and classes. “I get a lot of questions about core classes for public health students,” she says. Citations for research papers are another popular topic. In addition to her work and volunteer activities, Hill is gaining hands-on experience by holding down a 10-hour-per-week virtual internship with the Centers for Disease Control and Prevention translating scientific information into non-technical terms. She works for the CDC’s Epidemiology and Laboratory Capacity for Infectious Diseases program, which distributes funds to jurisdictions to battle infectious disease threats. In her work, she reads jurisdiction reports showing how funds are being used to promote public health and translates the information into success stories that can be shared with the public. She’s also helped Paul Gilbert, assistant professor of community and behavioral health, with a project involving social host liability laws. As for her next steps, Hill plans to apply to the Undergrad to Grad program in the UI College of Public Health, which enables students to earn both their undergraduate and graduate degrees in five years instead of the usual six. She’s currently pursuing epidemiology as her area of interest. Hill’s passion for public health is personal. “When I was growing up, my dad struggled with multiple chronic illnesses, including diabetes and arthritis, and this sparked my interest in learning more about diseases,” says Hill. She wanted to learn more about risk factors and prevention, as well as “living conditions that could have an effect on the outcome of these diseases,” she says. The field of public health—and epidemiology, in particular—seemed like a perfect fit. “When I started my public health classes, I began to learn about the field of epidemiology and realized that many of the questions I had been asking about what led my dad to have health issues were similar to the questions that epidemiologists ask when studying larger populations,” she says. Margaret Chorazy, clinical assistant professor of epidemiology and director of the college’s Undergraduate Program, agrees that there is “something special about our inaugural class of undergraduate students. In a way, they are pioneers. They have experienced so many firsts with us as a program. They’re like Leighton—eager, enthusiastic, motivated, passionate, and inspirational.